ADERTEK is a construction plaster is used for bonding ALLEV plasterboard, EPS (expanded polystyrene), XPS (extruded polystyrene), mineral wools (glasswool, rockwool) and composite insulation panels over surfaces like brick, concrete, aerated-concrete etc. It is the most convenient product for direct bonding applications where volume loss is required to be minimized. It has an high adherence. Its resistance increases quickly after setting. Bags should be store in dry places and should not be stacked in more than 15 layers. Direct contact with ground and moisture must be avoided. Using ADERTEK within one year after the date of production is recommended. 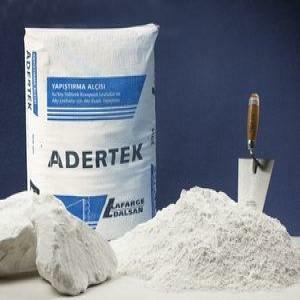 Poor or over-long storage may deteriorate the physical properties of ADERTEK. © 2019	Rivagips BG Ltd. All rights reserved.